A few weeks ago I posted about how busy this year has been for us in terms of geocaching. Well, it hasn’t gotten any slower! Earlier in July we spent a week on holidays in Cairns. We had a good time enjoying the warmer weather, and doing some day trips to Green Island, the Daintree, and Kuranda. While we were there we found our first ever Chirp cache, which was pretty cool. Now that we know the Chirp app works on our phones we’ll see if we can track a few more of these down. Once we got home from Cairns we continued on our Hidden Creatures quest. Along the way, each of the Shoes family reached a milestone. Sensible Shoes reached 800 finds, Shoes Junior made it to 450 finds, and Little Shoes logged his 350th find. It only took us 24 days to go from 700 to 800 finds – our fastest ever 100 finds. Finally, we ended up discovering the World Turtle in the Hidden Creatures promotion. When we first started on the quest, we would have been happy with getting the Yeti. However, it got to the stage where we were 17 finds away from reaching World Turtle, so we decided to put in one more day of caching to get there. Along the way we got to our 800 milestone, and Shoes Junior and Little Shoes had their best day of caching with 20 finds each. We’ll probably take it a bit slower now. We’ve filled in July on our calendar, but we’ve got quite a few gaps in August. I’m not sure if we’ll be able to fill it this year, we might need to wait until next year to do that. Our goal (which might be a bit of a stretch) is to see if we can get to 1,000 finds by the end of the year. We’ve got a couple of tools on order which should help us get around a bit faster and find more caches. I’ll talk about them in my next post. As well as working on a couple of other challenges, we’ve recently starting focussing on trying to find “unloved” geocaches i.e. ones which haven’t been found for six months or more. Our motivation for doing this is to rescue the caches to keep them active, and in some cases to confirm that the cache is still there. It gives us a warm and fuzzy feeling when we can let a cache owner know that their cache hasn’t gone missing. There’s also the thrill of the hunt, and knowing that we can accrue some more months if we can find the cache. There are several challenge caches which you can qualify for by finding a certain number of years worth of unloved caches. A few days ago we qualified for a “Five Forgotten Years” challenge cache, and we’re about halfway to the next qualifying level of 15 years. After that, we need to find 50 years worth of unloved caches in order to qualify for the next challenge cache. We’re using a couple of well-known online geocaching tools to help track our progress – GSAK and Project GC. GSAK (or Geocaching Swiss Army Knife) is a software program for Windows which lets you create databases of geocaches, such as all your finds or puzzles that you’ve solved. You can then run macros on these databases to calculate all sorts of statistics about your finds. 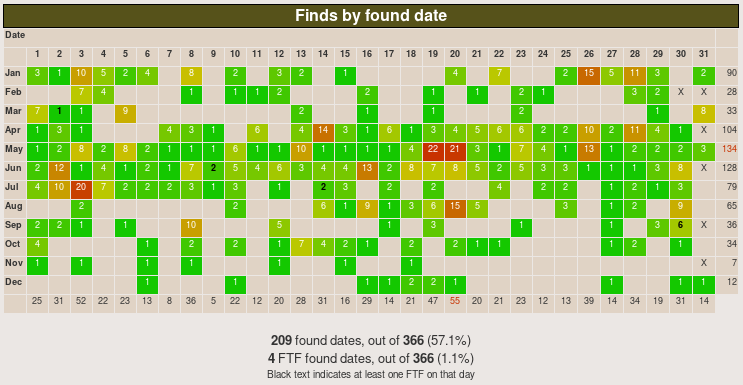 We use the PreviousFind macro to calculate the number of days that our unloved caches have been unfound. GSAK is free to download, but a nag screen appears after 21 days which you can pay to remove if you want to. Project GC is a website that can produce all sorts of statistics about geocaches. Lots of geocachers use it to produce statistics for their profile, but there are a range of other tools available, such as Days since last found. This feature has been very useful for us to plan which caches to find in order to earn some more unloved months. The basic tools on Project GC are free to use, but if you pay to become a member you have access to a lot more features. If you want to find out more about this great geocaching resource, have a listen to this episode of the Podcacher podcast, which features an interview with Magnus, the developer of Project GC. Wow, it’s been a busy year! 2018 is shaping up to be the biggest geocaching year yet for Sensible Shoes. We started the year on 524 finds, and currently we’re on 762 finds. That’s 238 finds this year alone – over half of all the finds from our previous 10 years! If we keep this up we’ll be at 1,000 finds before we know it (actually, in another 238 finds). We’ve taken part in the recent promotions that Geocaching HQ have run, which has helped to build our find count. The first was the Planetary Pursuit, which we didn’t complete, but we did get as far as Uranus. We’ve also gotten into the current Hidden Creatures promotion. 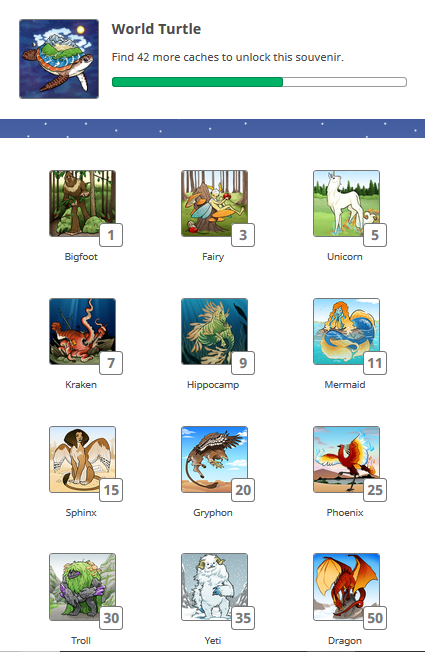 We recently unlocked the Dragon (which is available after 50 finds), but we’re not sure if we’ll make it all the way to World Turtle (for which you need 100 finds). At the start of the promotion we decided that we’d be happy if we made it to Yeti (35 finds), so we’ve done better than we thought. Maybe the World Turtle isn’t out of the question! As well as a record year for finds, we’ve also set a new record for hiding caches. We’ve put out four new caches, and so far they’ve all been found fairly regularly. Although they’re not a formal series, there is a bit of theme to their names (which also reflects the type of hide or the location) – Hedwig, Umbridge, Aragog, and The Hogwarts Letter. If you want to keep up with what we’re doing, we’ve got a new Instagram account where we’ll be posting pictures and videos of our caching adventures. Keep an eye out for an upcoming blog post about the various date-based geocaching challenges that we’re working on at the moment, and another post about our search for a special type of geocache.